This District May Close All Of Its High Schools; It's About Much More Than Money : NPR Ed The schools in Erie, Pa., have had money trouble for a while. To give his students a better shot, the superintendent wants to send all his high schoolers to the more wealthy, whiter suburban schools. 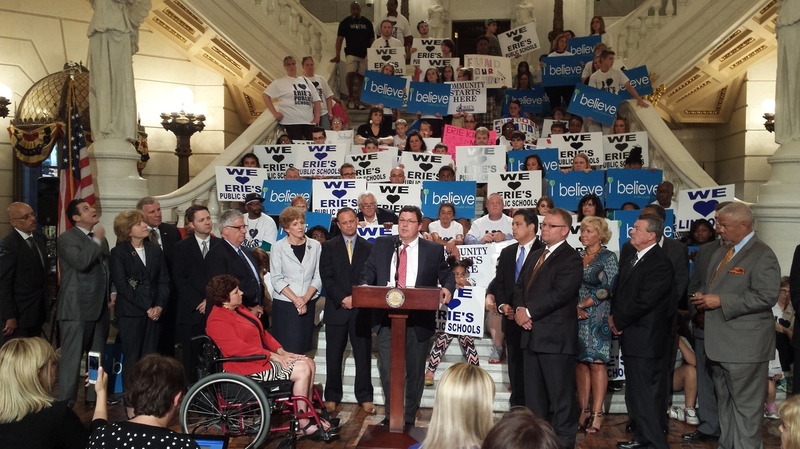 Superintendent Jay Badams leads a coalition of students, parents, educators and community members at the state Capitol in Harrisburg, Pa., urging lawmakers to alter policies that have left Erie's public schools on the brink of insolvency. In northwest Pennsylvania, along the edge of Lake Erie, you'll find the city of Erie. There, the superintendent of the more than 12,000-student district has forwarded a plan that's causing a stir — calling for leaders to consider shutting down all of the district's high schools and sending students to the wealthier, whiter, suburban districts. Superintendent Jay Badams says it's a "matter of fairness." Erie's schools have been pushed to the brink after six years of deep budget cuts, and he believes the children in the city's district — which predominantly serves students of color — are being systematically shortchanged. That's in part because urban school districts in Pennsylvania face a particularly brutal logic. They serve the poorest, most needy students. Yet, when it comes to state funding per pupil, most of them don't make the top of the list. "If our students would need to attend schools in other districts in order to have some sort of equity, then that may end up being the most ethical and moral decision," Badams says. The signs of Erie's fiscal distress would be hard for students to overlook. "There's a perception out there that kids living in poverty, kids living in the inner city, don't know what they're missing," Badams says. "Well, they do know what they're missing." "We're a city school and the surrounding districts are higher income, and they always think that they're better than us," says Nathan Stevens, a junior a Strong Vincent High School on the city's west side. "That's just how it works around here." Stevens, who is white, was one of a handful of students gathered in the school library at the end of the school year to talk about the plan to bus students out to those higher-income districts. "Everybody thinks it's a ghetto school, or that the people that go here are dumb, or bad," Whitney Henderson says. She's a year younger than Stevens and is African-American. She worries about what Badams' proposal would mean for her. "If I went to Harbor Creek, or if I went to McDowell, I'd feel like an outcast because of my skin color, because I'm black," says Henderson. "And everybody that goes there is pretty much white." Genene Mattern's children attend school in the Millcreek School District, in Erie County, one that might absorb kids from the city if the closure plan goes into effect. "I get a little upset when I hear other parents who are against it totally, because they don't want 'Erie city kids,' " says Mattern. "Now you're almost trying to put a racial spin on it, and that to me is wrong. They're children. I don't care what color, what ethnic background, what social background, they deserve a chance." And many of the superintendents in outlying districts, including Millcreek, have said much the same. "These are not city kids. These are not county kids," he says. "These are our kids across this entire region." And some public officials, including state Rep. Curt Sonney, a Republican who represents a slew of outlying districts, don't necessarily think it's a good idea, either: "It's difficult on any student to have to bus them for miles to a strange new school with all new people." There's a growing body of educators and researchers who say that figuring out the logistics of this proposal would be well worth the extra effort. "If the outcomes and the benefits that a school can provide to the son of a janitor are tied to those of the son of a congressman, then they are more likely to get those resources, right?" asks Quick, a policy associate at the Century Foundation, a D.C.-based think tank that advocates for school integration. Century says this happens, in large part, based on the superior quality and quantity of resources and teachers that are generally made available to richer and whiter schools. "And that's how we need to frame this, instead of making it sound like something magical happens when black kids sit next to white kids," says Quick. Century also argues that suburban parents don't need to worry about a negative effect on their children. "There's no evidence that points to that," Quick adds. The issue in Erie is even more complicated because of Pennsylvania's education funding policies. For most of the past 25 years, the state has distributed money without a rational, student-based formula. So although Erie is one of the state's most challenged districts, the state sends more money per pupil from its main pot of cash to most other districts in the county — including wealthier ones, with less pressing needs, that already have an easier time raising local funds. "The differences between the resources we have in the county compared to in here are just shocking," said Brian Polito, chief financial officer for Erie public schools. Polito used to have a similar job in North East, a rural district in Erie County. Drawing a comparison, he says last year Erie spent $6,000 on its 18 libraries. "In the school district that I came from, we had three libraries and our budget for library resources was almost $40,000." It's examples like these that have Millcreek parent Genene Mattern completely supporting the stand that superintendent Jay Badams has taken on closing the city's high schools. "People need to get mad. People need to get loud, because the more you just sit and let it happen, I think the more they figure, well, they're OK with that," she says. The Erie district did receive a modicum of relief in the state budget that recently passed, including a $3.4 million boost in basic education funds, and a one-time $4 million emergency supplement. But the systemic issues will persist, and Erie's finances are slated to be in the same straits by the end of the school year. Would Erie's crisis even be happening if it was a majority white district? Erie, and many other urban districts with a majority of students of color, would see a windfall if state leaders chose to implement the state's new student-weighted funding formula more aggressively. But they haven't. "I don't think so, but then I just question," says Dominique Booker, a student at Strong Vincent High School in Erie City. "I really don't know. It's a really hard question, because you look ... and they have more money, more stuff, but I don't want to think that way."